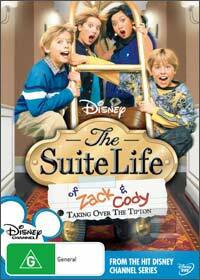 One of Disney's most popular TV series arrives on DVD that follows the lives of two identical twins called Zack and Cody who use their "identical looks" to get into a whole world of mischief which is definitely aimed at the younger market. Kim Rhodes plays Carey Martin, the single mother of these two twins and although both look identical, they are like chalk and cheese as Zack (Cole Sprouse) is the Bart Simpson like character with Cody (Cole Sprouse) as more the Lisa Simpson character, although the gags are thoroughly more aimed at children than adults which makes this a great Disney series as they don't attempt to cater for too many markets at once. The "Suite" comes into the play because the twins mother works at the Tipton Hotel who have given them a suite because she is their number one singer. Joined by some interesting supporting cast such as a Paris Hilton "clone" called London Tipton (Brenda Song) and the stuffy hotel Manager Arwin (Brian Stepanek), the gags are cute, original and enjoyable.